Ever since my little girl learned to stand up and started walking, she would explore all her surroundings. This includes the paper biting, having fun pulling curtains and the latest was the upside down backflip from her bed. These are only some of the many. I was busy cleaning our kitchen and dining room after we had dinner and J and the kids were already upstairs inside the kids’ room. 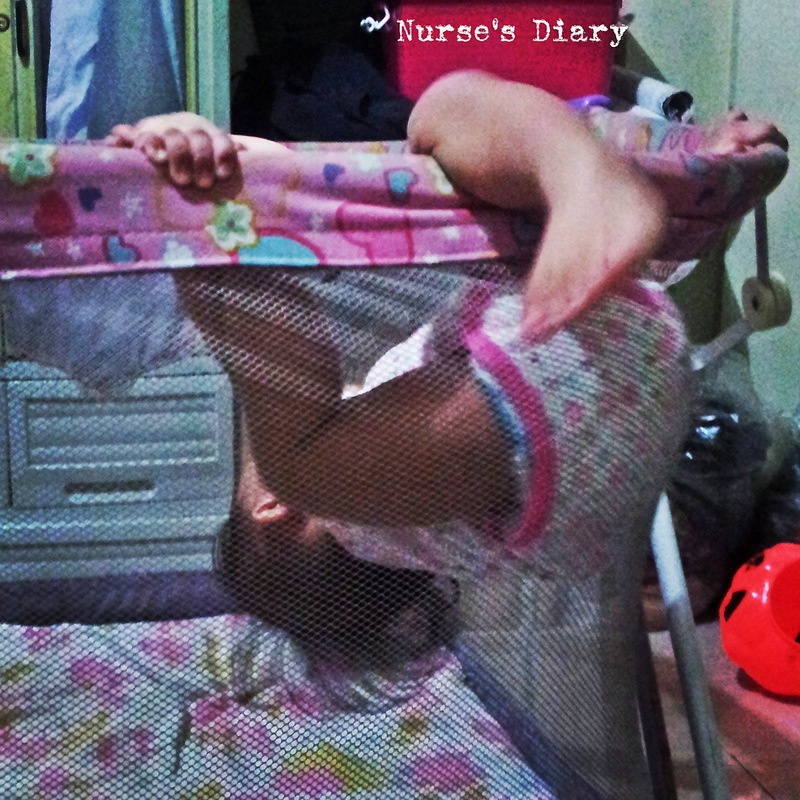 They were just having fun; the usual thing and suddenly I heard my son telling J upendow (upside down). I thought he was just the one doing it but when I heard J asked her where was the “ouch” I immediately rushed to their room and found them playing the upside down thing. I was astounded with what I saw! I have never expected that she can actually do it considering her size. While I watched the video, it seems she didn’t have any pain to complain except that she knows I was already looking at her and she seemed to be hesitant already. Of course I was speechless and all I said was how were she able to do it? Oh I don’t know. But all I know is, I might have a future gymnast and cheerleader in the making. Yes, she made me miss my cheerleading days back then. Back when we used to stay up late to perfect our moves for our cheerleading competition for the school's intramurals. Maybe I have to accept the fact and to keep reminding myself that I am a mom already and I should practice the act of supporting my kids develop their talents. Oh boy, this is gonna be hard I know. But then, I know it’s too early to tell what they will become in the future and all I know is they need my support to achieve their dreams in life. I was once a frustrated gymnast by the way so I ended up joining the cheerleading squad instead. I hope my little girl will be able to use her talents in wisely and let it be an avenue for her to strive hard to be better in whatever she do. What are your kids’ breathtaking moments? How do you deal with it? Share yours. A Moments : Escape and Waboo! TLC : Wat tat Pweese?